Bill Smith shares concerns about the planned apartment complex at the base of Pilot Butte during the Aug. 5 City Council meeting. Supporters of Pilot Butte State Park have found themselves entangled in a land use process after learning about plans for a new apartment complex at the foot of the Butte. 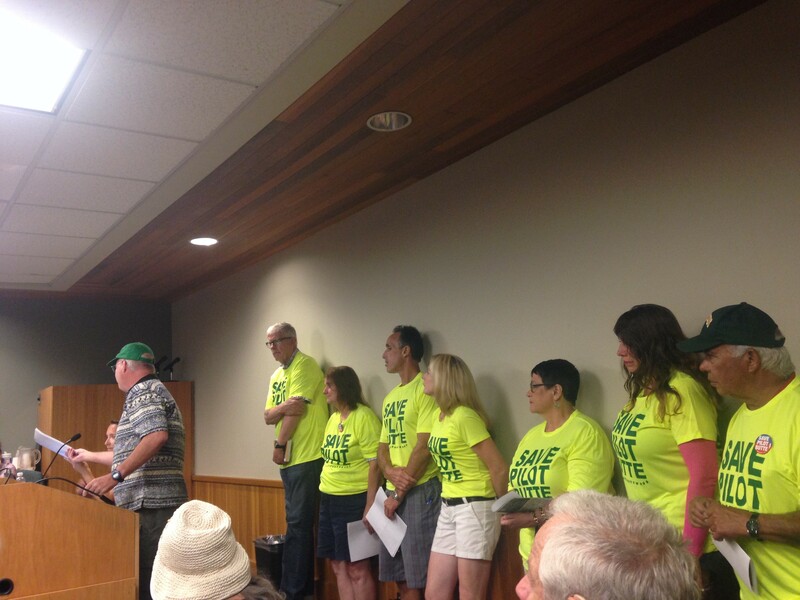 Because their concerns emerged after the public comment period for the development, members of the Save Pilot Butte group sought to appeal the development's approval, launching a fundraising campaign to cover appeal fees. However, City planning staff told the group that because they didn't file comments during the comment period, they don't have standing to appeal. The group is challenging that notion, while also asking the City to make its own appeal. Earlier today, the group's de facto spokesperson Bill Smith, a former Oregon State Parks host at Pilot Butte (and husband to the well known Butte Lady, Carol Smith), sent a lengthy email to City Council. In it, he expressed the following concerns. "[City Planning Manager] Colin [Stephens] pointed out the nature of the problem in getting a date on the sign. There is obviously a way to get the date on the sign (several ways in fact). When he gave me his explanation, I called him on it and he admitted there were ways. I was surprised to see him presenting this argument to council and most people shaking their heads in agreement. The argument doesn't hold water. That's obvious. If you want a date on a sign, you can do it. I can't imagine any citizen buying the argument that it can't happen. But the date is only a start. The signs need some indication of people's rights more than anything and while dates associated with that would be nice, more important would be a few lines of small but readable text explaining concisely why the signs are there including the importance of the 14 day period. I've been talking with reporters a lot. I always bring up the signs and they always agree they are inadequate. The other day a reporter asked why there isn't a QR Code? The QR code could take people with a scanning app right to all of the relevant information on the web including the site plan. Ten to 14 days is a short time for people to get a sense of what is going on. I'm on record with many complaints about the type of answers I got from two different city planners. Getting people to the information they need quickly would seem both an easy and worthy goal that costs next to nothing. A QR code would be one possible mechanism." "You need to build into code things about unique circumstances that might be encountered. Sure that might complicate things a bit but it was pointed out that these developers are sophisticated and I think they can handle a system that is slightly more complicated. Here's an example not yet mentioned. The people notified directly are property owners. Renters are not notified. Most of the people located around this development are renters. It could even be that they all are. Maybe in a situation like that you should alert renters. It's inexpensive and easy through the post office. It costs no more than alerting property owners in a more traditional neighborhood. So, say if 50 percent or more of people living in the target area are renters, maybe that triggers notification directly to all renters. Since it doesn't cost more, maybe you just always include renters." "Here's something else unique, the main landlord notified was the developer because they now own the large Pilot Butte Commons Apartments. I would think that in a situation like that it would make sense to expand the target area. Some landlords might actively seek input from their tenants to decide if they should respond. With the obvious conflict that Evergreen Development had, that is much less likely to happen. FWIW, I seriously question the statement made by Colin that once the signs go up, the phone usually starts ringing off the hook. But I don't work in his office and so I really don't know. What I do know is if you take the issues you are already aware of with the signs themselves, these signs in particular (see below), renters not being notified in an area where most people rent, and a large portion of the target area for notification being owned by Evergreen Development, it makes sense that it took a while for people to get on board. I think the proof in this case is how fast and strong they got on board as soon as they knew." "I'm not saying how it happened (incompetence or intentional), but I'm convinced that the traffic study needed to be redone. Whose responsibility is it to determine that? If it is the city's responsibility, why was this missed. If it is the developer's responsibility, what are the consequences for submitting a report so seriously flawed? I have no intent to investigate further, but I think you should because I have been told these are not minor matters. They directly involve public safety. Is there any way when something like this is learned late in the game to fix the problem or are taxpayers expected to pay the bill for the improvements that will be needed?" "Here's the request. Contrary to what you were told, I believe the City Council does have the ability to take up this matter on appeal on your own motion. In other words, while standing was denied to us, the council must have standing in some shape or form. It's not just my opinion, it came from competent practicing land use attorneys. I did my homework. While we were never able to get one of these attorneys to work for us for free, we were able to get a few questions answered. You may have been sued by the developer, but would the developer win? If you have standing, then you have a right to exercise it and actually represent the citizens who elected you. You also have insurance in case you are sued. That's what I'm told. But for something like that to happen there would have to be a meeting of the minds and it would have made more sense to accomplish something like that during the working session or some special session that followed." Smith and the Save Pilot Butte group have stressed that they are aware of Bend's housing shortage and are not opposed to having a new apartment complex in the area, but they are worried that, without input from Oregon Parks and neighbors, the project as proposed will cause safety issues. They are also concerned that an approved variance will allow the apartment buildings to be tall enough to obscure the views Pilot Butte is so well known for. The window to file an appeal closes at 4 pm Monday.